The Connector for M-Files enables the M-Files Document Management System, named M-Files in the following, to be used as a storage method for files that are stored in Intrexx data groups as usual on the local file system. In addition to saving files, metadata for a file in M-Files can be maintained and edited in Intrexx. For the portal users, therefore, it makes no difference whether a file available in the portal is stored locally or in M-Files. The following chart shows the role of the connector and the involved components. A file data field in an Intrexx data group corresponds to a Document object type and a class in the M-Files DMS. One or more files can be stored for each file field, depending on whether the document in M-Files corresponds to a one-file or multiple-file document type. Files cannot only be saved to the M-Files DMS, but can also be directly opened and/or downloaded from M-Files in an Intrexx portal. Access to M-Files here occurs via a specific M-Files user, through which all permissions in M-Files are taken into account. 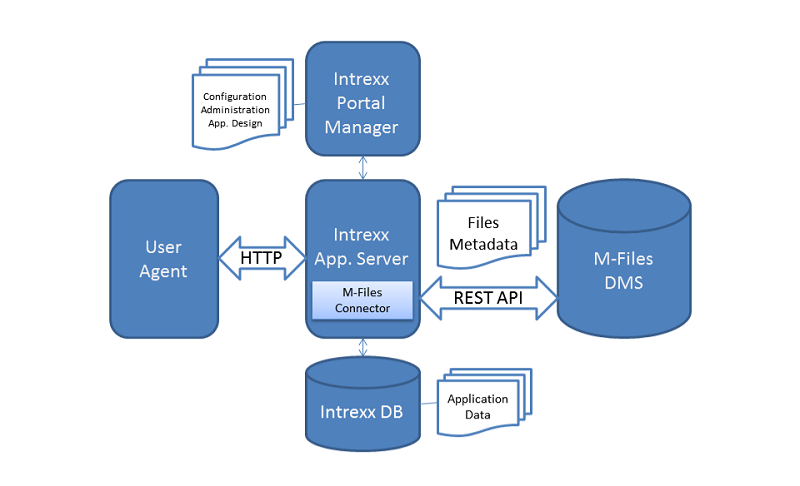 Depending on the authentication mode, Intrexx portal users can log on directly to M-Files, or access can occur through a static user that is saved to the file field configuration. Fundamentally, Intrexx will be considered as the leading system when discussing it in combination with M-Files. This means that files are uploaded and metadata is entered to Intrexx, and then they are passed to M-Files. This also means that metadata is saved both in M-Files and to Intrexx data group fields, though files are only saved to the M-Files DMS. A full text search of the document contents is not possible in Intrexx without additional steps, since the files are kept in M-Files. In this case, it is recommended to use the M-Files Web Access Client to search. The same actions are available in the Processes module as those that are available for normal Intrexx data groups. This allows files to be transferred from Intrexx to M-Files and back again controlled by processes.